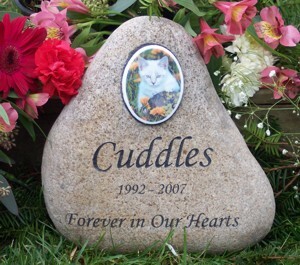 Your baby's photo engraved onto a ceramic tile in color and placed on a beautiful River Rock memorial. Also included are three lines of the text of your choice on the Memorial. These Unique Photographic River Rocks combine superior quality Engraved River Rocks with a NEW permanent photographic ceramic technology. The new proprietary technology, combined with the use of inorganic ceramic pigments, guarantees the highest photographic standards for quality of imagery, clarity and durability without the loss of your original photo. The ceramic photographic tile measures 2 5/8" x 3 3/8". All images are Kiln fired into the top glaze of the ceramic plaque, at temperatures in excess of 1600 F.
Due to the complexity of creating the photo etching you can expect delivery to take four to six weeks from the time your baby's photo is received. Overall size of your River Rock is 10" x 16". Once your order is completed we will contact you to arrange receiving your photo and confirming your text.